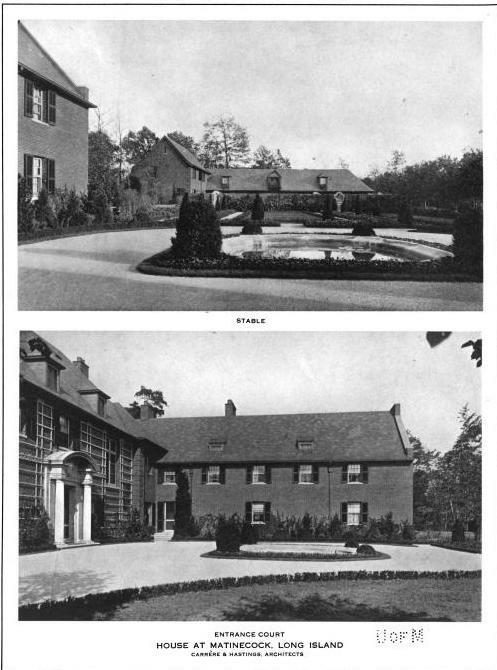 'Woodfold', the Robert Scott Lovett estate designed by Carrere & Hastings c. 1911 in Lattingtown. Lovett, an attorney, was general counsel and later president of the Union Pacific and Southern Pacific Rail Roads. 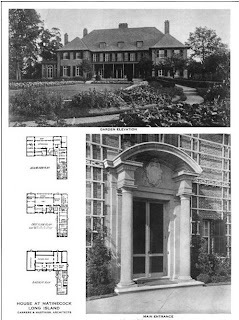 Lovett also had Carrere & Hastings design a stable, farmhouse and gardner's cottage as well as alterations to the main residence in 1915 and 1925. 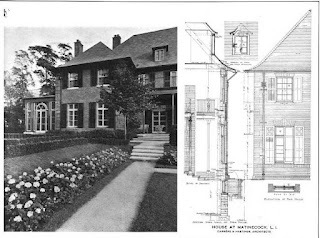 The estate's subsequent owner, Albert Henry Diebold, founder of Neuralgyline Co., had C&H design alterations in 1927. The estate was later owned by Diebold's son Trevor Diebold. 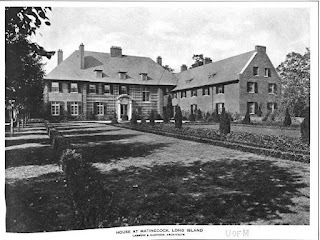 'Woodfold' was demolished sometime in the late 1940s. 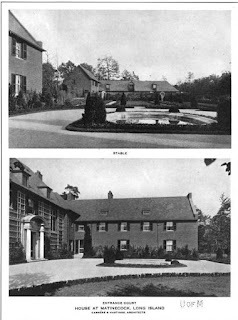 Click HERE to see where 'Woodfold' stood and HERE to see the entrance gates to the estate. 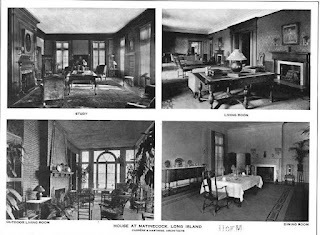 The stable seen in the photo below that sat across from the entrance to the house are extant, click HERE to see the site on bing. 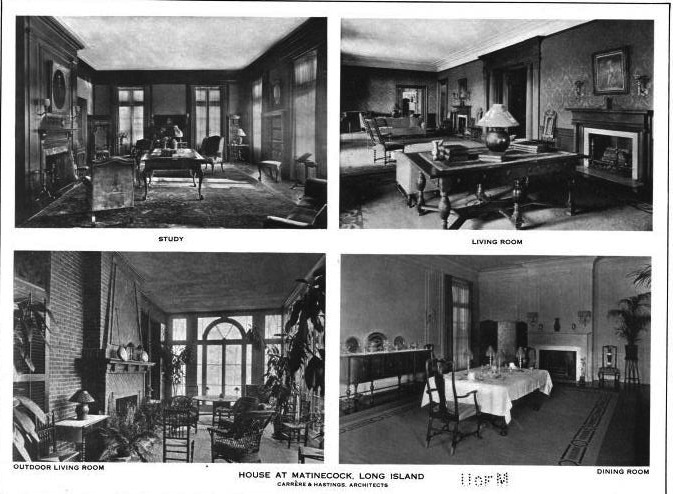 Photos from The Brickbuilder, 1913. 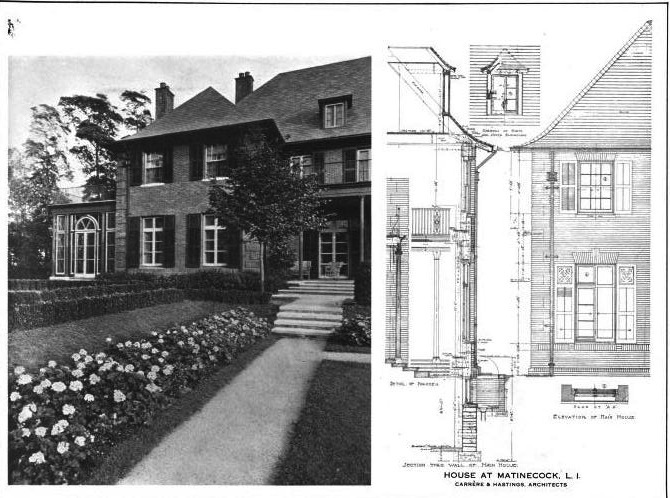 A pleasant house. The iron scrollwork on the entrance gates are very well executed. Here's another home with a long driveway where the house is strangely situated in close proximity to both the property line and street. I thought I recognized this as the entry gate to Eden Roc Drive off Bayville Road but can't really tell from the map - anyone know? I had the estate name wrong...it is 'Woodfold'. Have made the appropriate changes.